The litl webbook is a simplified experience removing computive administrative debris such as files, folders, viruses, caps lock keys, and confusing function keys to focus on photos, videos, music, news, email, and empowering the web we use more than our computers. 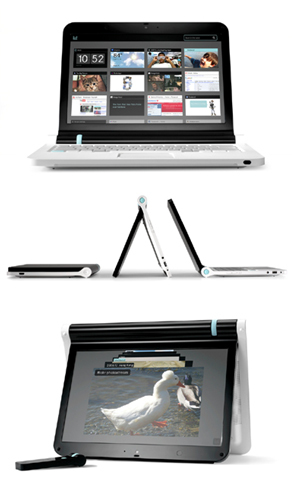 The webbook also flips over to an easel mode turning web pages into streaming shows to watch the web like TV. Sit back relax and let the litl webbook do the rest. The litl webbook is a collaborative project with fuseproject, pentagram, cooper, moto, and an amazing team of designers, developers, and idea shakers at litl. 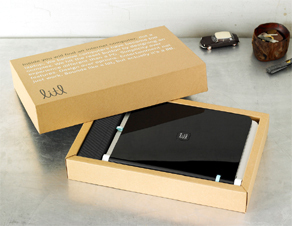 Unlike other computer companies a great deal of time was spent designing a package that can ship in its own box, eliminating the need for an additional protective box to reduce carbon footprint by minimizing space needed for transportation. 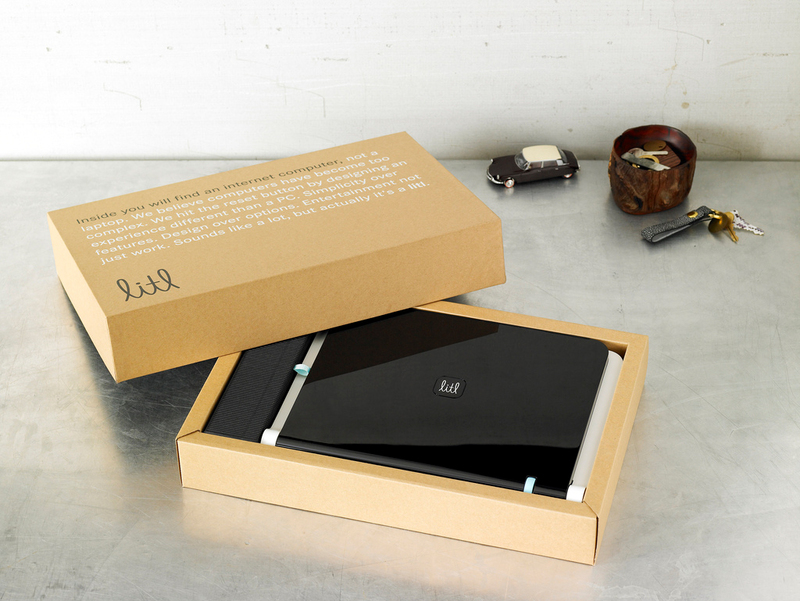 The entire package is made from recyclable paper with no plastics or foams in use. A large graphic message from litl welcomes customers for what's enclosed. 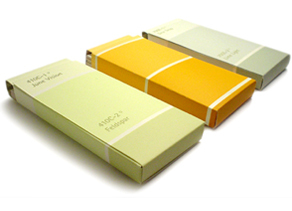 The interior has small removable boxes to be used as desk containers. Also, instead of inserting an unused instructional book that most people keep hidden in their closet, one of the world's best illustrators David Macaulay created several cards visually introducing the world to the way litl works, both in hardware, software, and in philosophy. 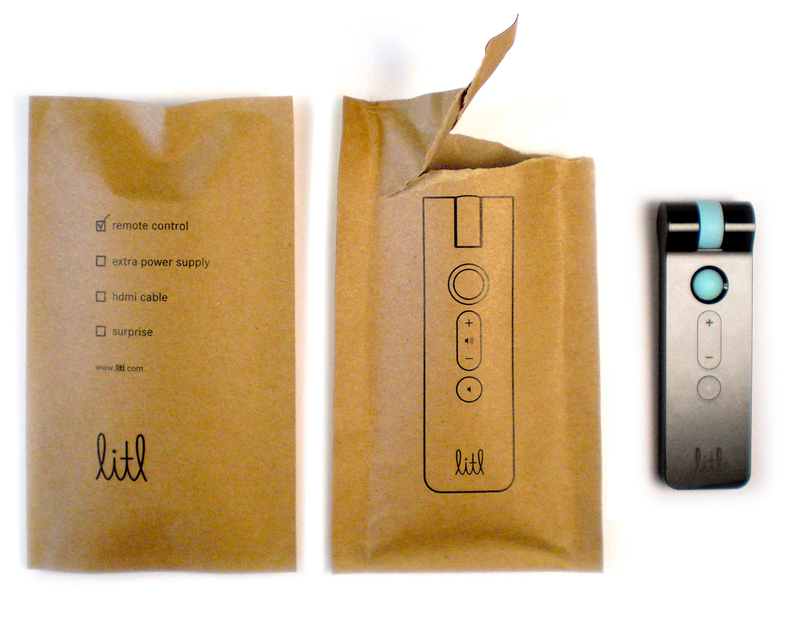 Following alongside the simplified litl webbook packaging, a paper based pouch was created to wrap around the candy-bar like remote control. The paper pouch has a simple graphic indicating what's inside. A customer tears open the pounch like a bag of chips and pulls out the freshly sealed remote control. 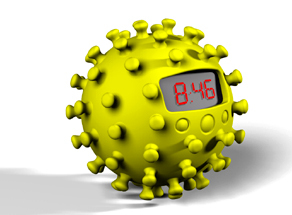 The Anemone Clock is a feisty little alarm clock with a bit more personality guaranteed to shake and wake anyone out of bed! Conventional alarm clocks only use sound to wake you up, but as many sleepers know, a quick flick to the static snooze button leads right back to sleeping without ever really opening your eyes. Please view the process document to further understand the design process and how problems and solutions were solved. When bicyclists want to talk to each other, they usually have to ride side-by-side, which is dangerous when on the side of the road. 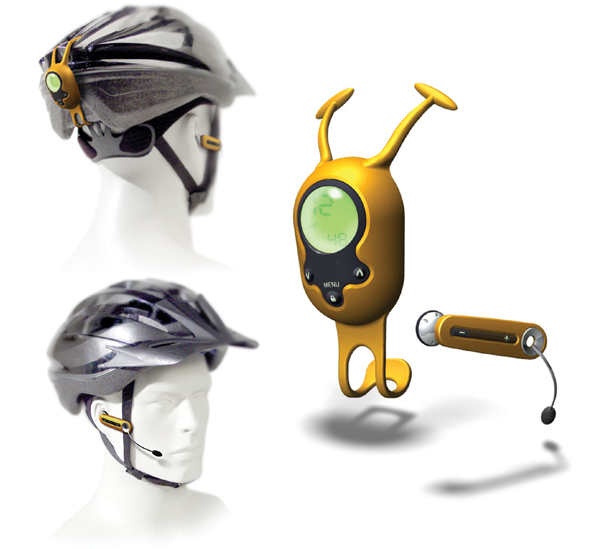 The BikeBug allows bicyclists hands-free access to two-way radio communication with one or more friends. 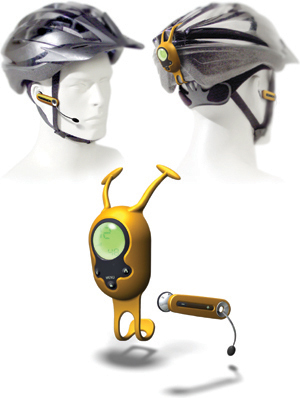 The small device attaches to the user's helmet in three places-two points on the back hold the radio and one clip on the helmet strap holds the microphone and earpiece. The unit is voice-activated and the transmission circuitry is "full duplex," which means the users can talk to each other naturally, without waiting for the other to finish. 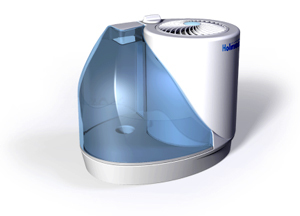 The unit can also be used by snowboarders or rock climbers. 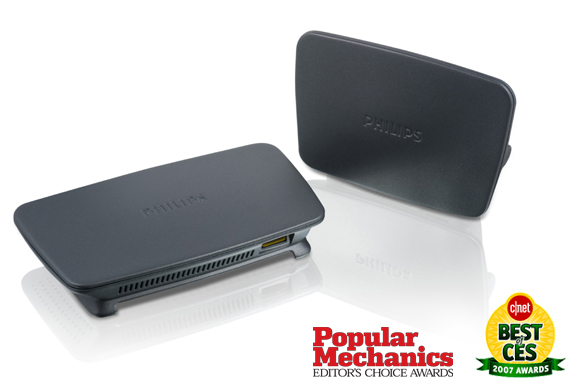 The UniCast� is the first wireless HDMI in-room solution that can transfer an uncompressed 1080p signal without any signal loss with a range of 25 plus feet. 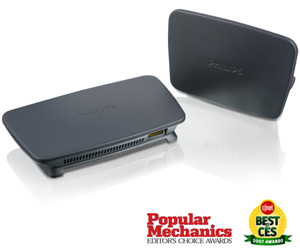 The system operates in the ultra wide band (UWB) range which has no interference with traditional wireless devices. 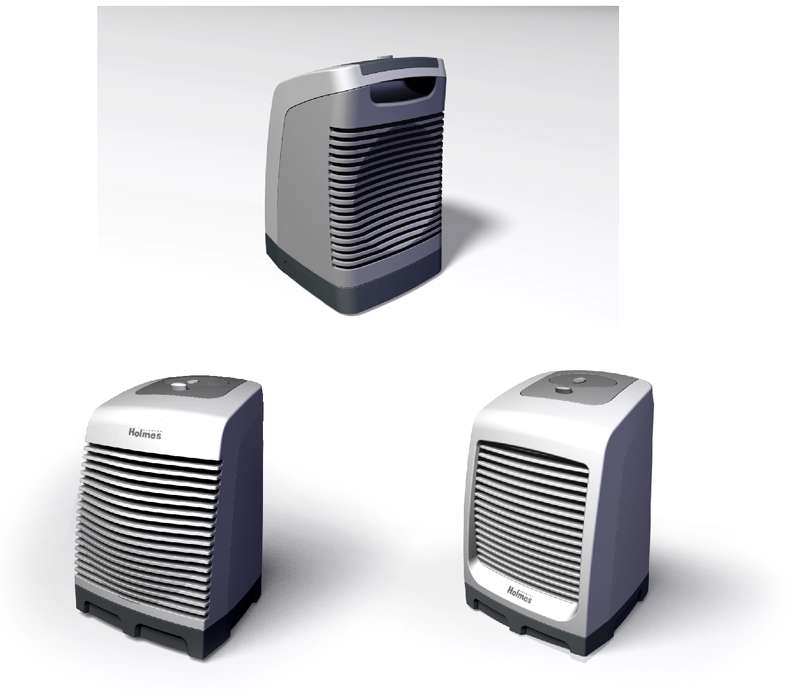 The units can be placed anywhere within a room without any signal loss. A sample from a series of "flower" inspired concepts for the Sony "liv" collection. 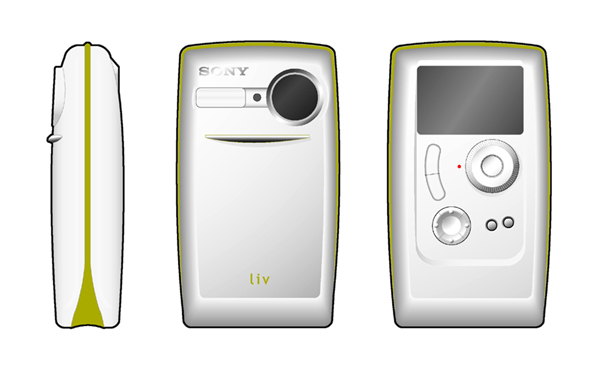 A sample from a series of "simplified" inspired concepts for the Sony "liv" collection. 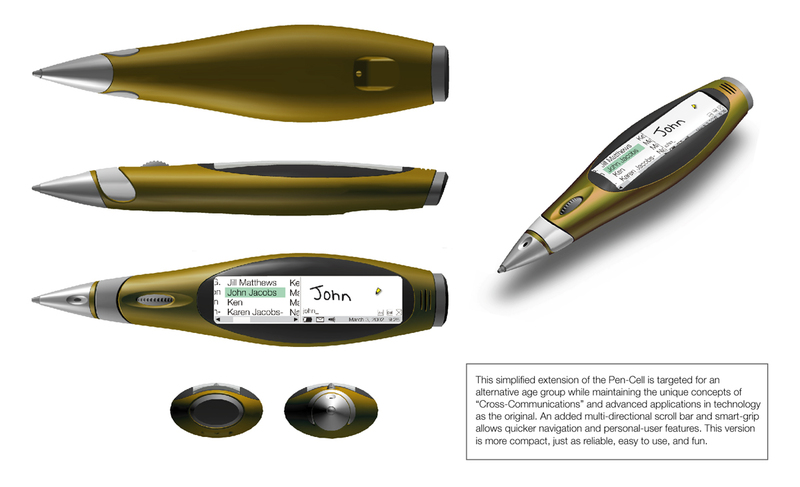 The Pen-Cell takes technology to an innovative level by creating a platform that eases communication with others. 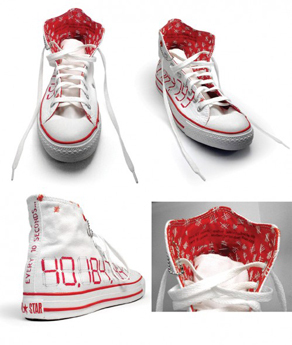 It utilizes basic text and voice technology, allowing you to write in information and see sound. This design enhances communication within any environment, loud or quiet, allowing for private and quiet conversations (Imagine being able to have a silent conversation in a restaurant without interrupting those around you). 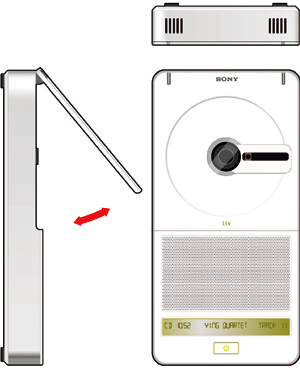 It is also an ideal solution for the hearing-impaired who depend on visual cues to communicate. More importantly, the Pen-Cell serves as a memory aid. With today's technology, people become reliant on their devices to store information. Once that device is gone, it is difficult to recall particular pieces of information. Through the act of repetitively writing and then seeing a name and number, a user acquires a recollection of the information. The design of the Pen-Cell is ergonomically comfortable, easy to use, fun, and reliable. 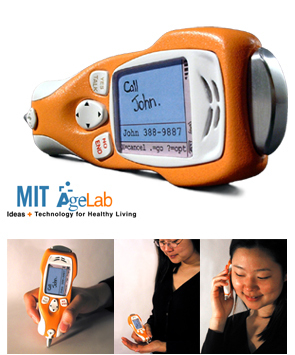 The Pen-Cell is a research project in collaboration with the MIT AgeLab. 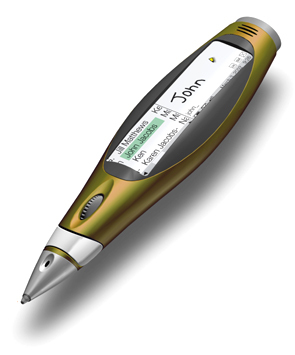 This simplified extension of the Pen-Cell is targeted for an alternative age group while maintaining the unique concepts of "Cross-Communications" and advanced applications in technology as the original. 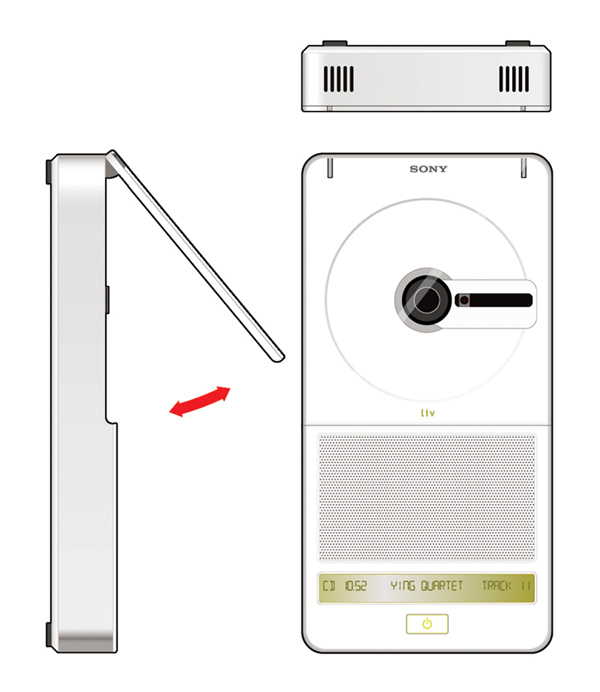 An added multi-directional scroll bar and smart-grip allows quicker navigation and personal-user features. This version is more compact, just as reliable, easy to use, and fun. For Microsoft's highly anticipated launching of their new operating system "Windows Vista", many new functions were added to the windows "start button" and keyboard. 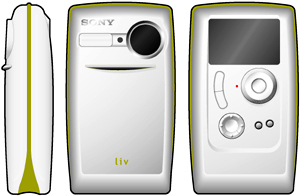 For this project, various concepts were created in re-defining the start buttons function, placement, usability, shape (physically and graphically), brand message, and brand awareness along with several yet to be released buttons and experiences. Several designs ranging in timeframe for new buttons, placements, and functions were taken for current and future generations of Microsoft products and will be seen as new applications and platforms are launched. PROBLEM: Their badge is ugly, old, non-representative of the quality of the conference, and bothersome to wear though used constantly. REASON: The events in Italy and fashion is crucial. No one wears the cheap plastic badge clip, yet they constantly used it. OBSERVATION:Instead of wearing the badge, they kept it in their pockets or hands. IDEA: Create a badge designed to be held and not worn. Take advantage that the badge is always held, and make it more useful for this audience. 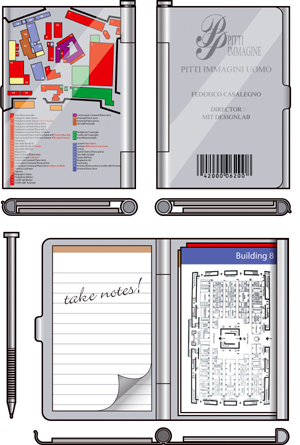 SOLUTION: �Pitti Folio� is an first-class aluminum identification badge that stores business cards, credit cards, IDs, map cards, an RFID chip, and a notepad along with a mini pen to simplify ones business needs at this buying event. It is no longer just a badge, but a meaningful item useful before, during, and after the event. Ambient Devices asked to create a simple ambient device that was as simple as their "stock orbs" but also indicated a history or sense of time. This simple design uses the metaphor of a clock, indicating a stocks change value throughout the day by having independant LEDS representing every hour of the trading day. The Digi-Sheet tablet benefits a wide range of musicians from learning, to practicing, and performing at any level of playing anywhere. 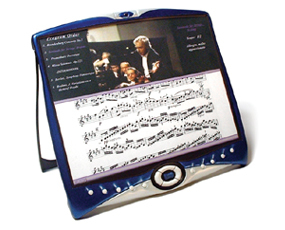 The Digi-Sheet takes advantage of tomorrow's technology for today's users from a simple task of adding a stylus pen (to eliminate broken pencils and ghost lines on sheet music) to the use of Bluetooth (to enhance the means of communications in orchestras, bands, and much more). 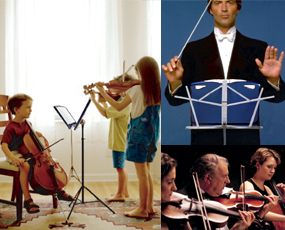 This product is based on the problems and needs of the most important people in design, the users: musicians, teachers, and people who want to learn an instrument. 1)Sound-Check software: the ability to have the software as a teacher aid. 2) Auto Scrolling and sound recognizing music: no need to stop playing just to flip the page. 3)10 buttons: easily and quickly navigate to measures faster. 4)Blutooth communications: allow the conductor to quickly turn everyones attention to specific measures for practicing or change logistics during live shows. 5)Camera: easily practice remotely without losing the important visual cues. 6) Sound recognition: Play and let the software jot down the notes. 7)Adapatable hardware: making the new hardwars fit and adapt to previous sheet music environmentts for the better. 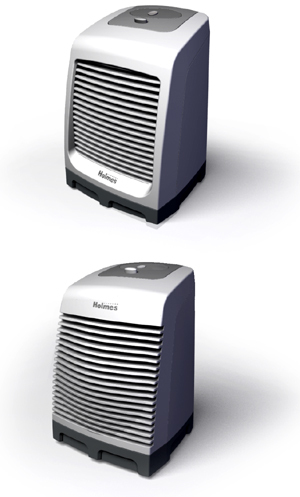 Two bolder and more refined designs from a previous model. 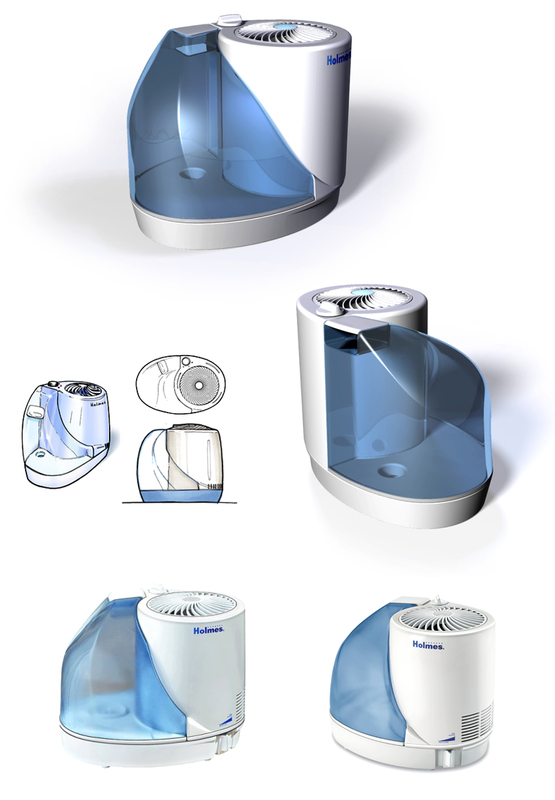 A household humidifier for Holmes Products inspired by the flow and movement of water. 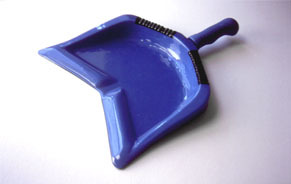 This dustpan eliminates the annoyance of those magical dust-lines that appear after dusting. In this design, problems, reasons, and solutions were made to figure out why dust-lines appeared after dusting. The main reasoning came when looking really close to the dustpan while it collected dust. As a dustpan ages, the front edge gets bumpy or at least it flattens out, like a wall. Once this wall is apparent, the dust has to be swept over the dustpan wall somehow, but in most cases the dust has nowhere to go. In this design the walls are angled inwards, creating a direction for the dust to go, towards the center, where the line of dust creates a larger piece of dust that can more easily make it over the wall. This design does not totally eliminate the magical line of dust but reduces it to a small dot. 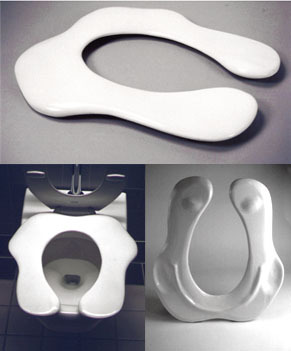 This toilet seat/tray is designed to create a new look and feel for tomorrows toilet seats. 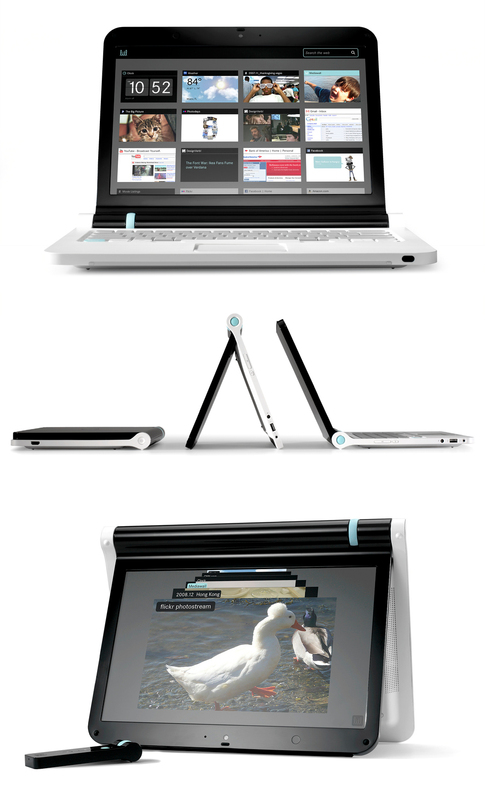 Studies of ergonomics, aesthetics, consumer needs, and fun were all part of the overall design. Restrictions in the design were to make the seat cost efficient in manufacturing and targeted towards public use, for public restrooms. The final results of the toilet seat gave the toilet seat a form that was more interesting, comfortable, practical, cleaner, and more user friendly. 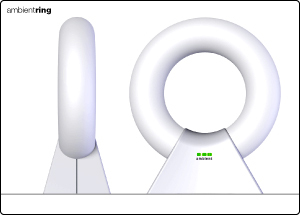 Please view the process document to further understand the design process and the benefits that were created in this new toilet seat design. This is a door handle that was designed to reduce a step in the process in opening a door. 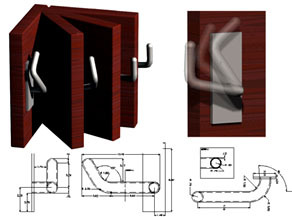 In this design the need to switch hands when opening some doors has been eased or eliminated. An ergonomic handle has also been incorporated into the design for feel and comfort. 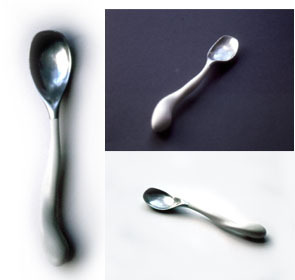 This spoon was created based on the ergonomics, aesthetics, and looks of a spoon that would look good with two other products, a salt and pepper shaker and an egg holder. 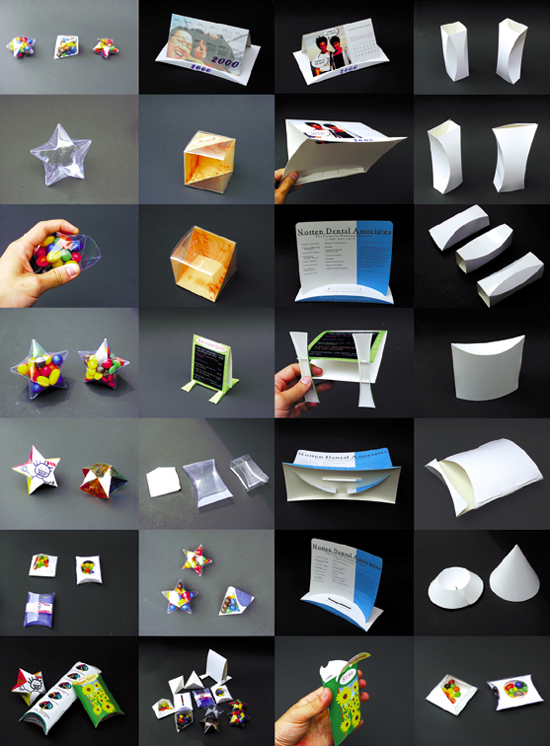 A variety of forms were created while the other two products changed in form. In the final decisions for the final look of the spoon, ergonomics became an issue that did not matter as much as it did at first. The spoons looks became more important as a visual pleasure over a hands on pleasure although it was still comfortable to hold. Please view the sketch models that were made prior to the final model in the models section. 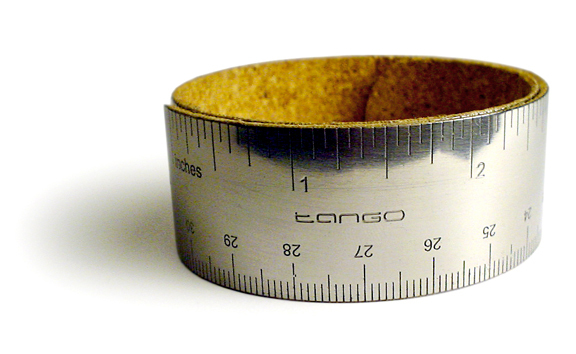 A simple 12-24" ruler designed to be portable and compact. Inspired by the popular "slap bracelets" that everyone had as a child back in the 80's. 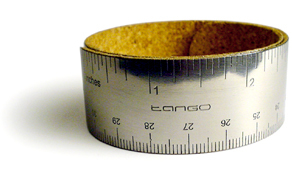 Lock the ruler straight to use, then snap it back to shape to store away� even slap it onto your wrist like the good ole days! 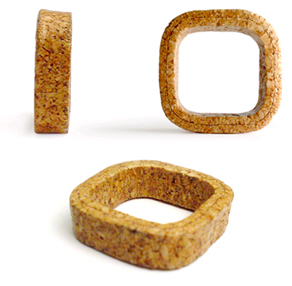 Includes a soft cork backing. A simple cork ring compressed into a square that I made from some leftover materials laying around along with some compounds to give it a stronger structure. Larger picture here! Soft, fun, and changes textures overtime. I needed a card holder for my custom sized cards, went over to home depot, grabbed a few of those paint chips, picked my favorite colors, made a few bends here and there, and bahm, I have my very own cool hand-made paint chip card holder! Many more pictures on my blog with a DIY guide here. 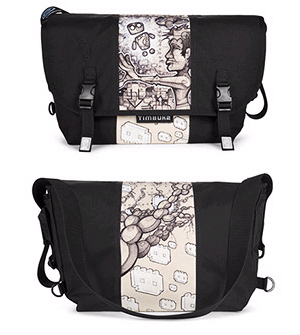 I had the wonderful opportunity to create an artist bag for "TIMBUK2's Charity Auction for the Homeless Youth" taking place June 15th 2006 in San Francisco. More pics and info here! 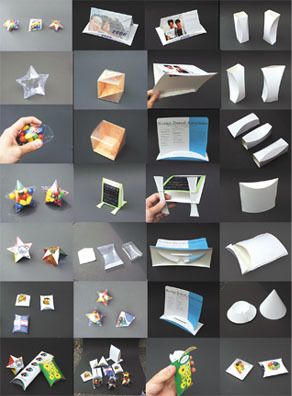 These are samples of packaging and display models made from perforated sheets of high-gloss paper and pvc allowing home users or a small business to create their own graphics on a variety of designs for different uses. Assembly required no glue or tape.